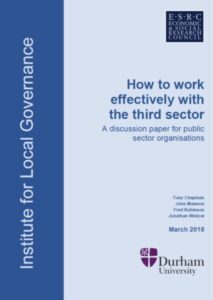 by Tony Chapman, John Mawson, Fred Robinson and Jonathan Wistow, Published by Institute for Local Governance, 9th March 2018. Public-sector bodies tend to share common values and approaches to policy, procedure and practi ce which shape ideas about what is ‘possible’ and ‘desirable’ when thinking about working with other sectors. These values and practices stem largely from the fact that they are large, complex, formal and publicly accountable organisations. Large organisations, by definition, have a complex division of labour and principles of professionalism are underpinned by shared values surrounding expertise and specialisation. As hierarchical and bureaucratic entities there are strong imperatives to ensure that practice is, as far as possible, continuous and consistent, and that services provided are apportioned fairly and are of equivalent quality or value. Similarly, ways of rectifying complaints or correcting internal failures are embedded in organisational culture, structure and practice. The problem is that most TSOs are not large, formal complex organisations. Often they do not necessarily share the values that underpin the structures and functions of public sector organisations. And many people in the third sector may feel that their organisations came into existence to tackle issues which had been ignored, neglected or even caused by the failure of big public-sector bodies. Commitment to specific issues and causes often overrides ‘generalised’ objectives in the third sector. This is not a flaw in sector dynamics. Instead it merely reflects the strong sense of independence held by TSOs and their close focus on their mission. These generalisations about differences in values may not be immediately obvious in inter-sector interactions – and most often interactions are quite good. But they can, all too readily, come to the surface quickly when problems occur. In our report we say that there are ten ways that public sector organisations need to ‘think again’ about how to work with the third sector. And we have a good deal more to say about ‘what not to do’. What we say isn’t that hard to do – and much of it people will recognise in their current practices. But keeping things simple isn’t easy. And it’s a big complicated issue that doesn’t lend itself to soundbites – but we hope that for those who make the journey through the ideas we present – it might help to make relationships better for all concerned. The report can be downloaded here: ILG How to work effectively with the third sector discussion paper March 2019.